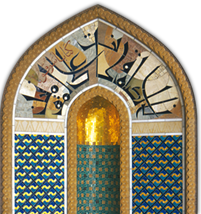 An extraordinary Oman exhibition took place in the Berlin Museum for Communication under the title "Greetings from Oman." The event was arranged and organized by the German-Omani Association in cooperation with the Omani Ministry of Tourism, the Ministry of Awqaf and Religious Affairs and the Omani Embassy at Berlin. 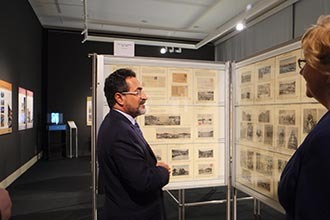 The exhibition showcased Omani culture, religion, history, society and for the first time ever rare pieces of Oman philately. 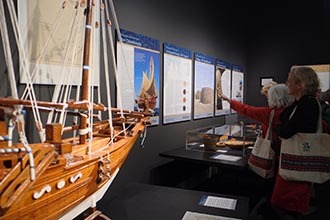 The exhibits included also valuable silver jewelry, Omani khanjars, cloth, ancient trading goods and a model of a dhow, the typical Omani sailing ship. The opening ceremony on March 5th was attended by more than 400 representatives of politics, society and tourism, and HE Ahmed Al-Mahrizi, Omans Minister of Tourism. The German Post issued a special postage stamp for the exhibition which was distributed at the location itself. 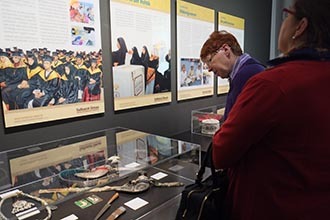 Words of welcome were spoken to the audience by Mrs Liselotte Kugler, director of the museum, Mr. Bruno Kaiser, president of the German-Omani Association, and Mrs Hind Al-Barwani on behalf of the Oman embassy. 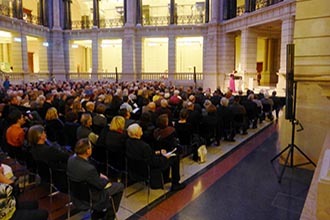 The exhibition, held in the oldest museum for communication in the world, was visited by about 8000 people.